← Glass Baron Bear only $10! 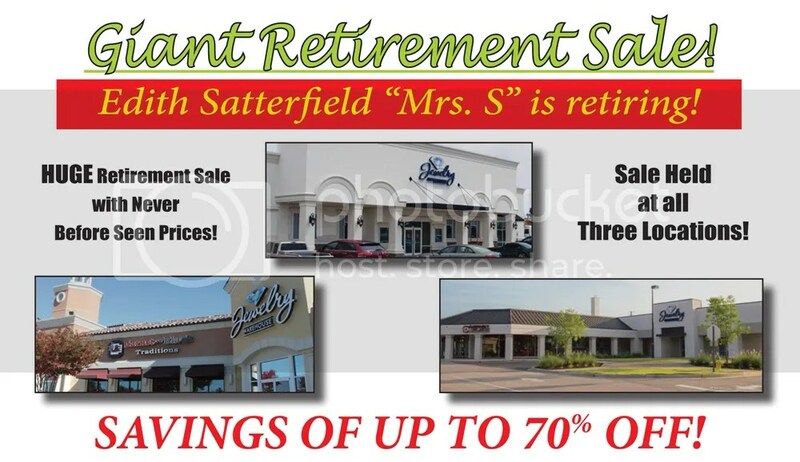 Retirement Sale! Savings up to 70% off! I’d like to tell you about a wonderful journey that started 50 years ago when my late husband, George, and I decided to go into wholesale jewelry sales. In 1977, tragedy struck after an accident that left George burned over three-quarters of his body and only a 10% chance of survival. With help from our church, loyal employees, and God’s grace, this adversity resulted in the formation of a retail store that you know as Jewelry Warehouse. Over the years, as time and taste have changed, Jewelry Warehouse has too. The needs of local customers caused us to offer different emphases: Jewelry Warehouse Inc. for fine jewelry and accessories, Garnet and Black Traditions for Gamecock merchandise, Tiger Paw Traditions for Clemson products, and Palmetto Traditions for items showing pride in our state. We kept our commitment to providing quality, selection, and value all under the banner of Satterfield’s Jewelry Warehouse! But there are big changes afoot at Satterfield’s Jewelry Warehouse. I want to let you, one of our most loyal customers, know first. After many years in the business, I’ve decide to retire (This will allow the younger Satterfields to innovate and allow me to have some fun while I still can!). For you, that means we’re offering you truly exceptional prices on our best jewelry. In honor and appreciation of you, our friend and valued customer, you are invited to a Grand Retirement Celebration with savings up to 70% OFF*, in-store only! To find the store closest to you, click this link. We haven’t forgotten our online customers, and invite you to use promo code EDITH during checkout to receive 20% OFF* your entire order, with FREE shipping! I am grateful to each of you for your many years of loyalty and friendship. These amazing prices are a small way I can say Thank You! Please stop in to say goodbye and help us celebrate! This entry was posted in Jewelry, Jewelry News, Sales and tagged clearance, retirement sale, sale, satterfield's jewelry warehouse. Bookmark the permalink.